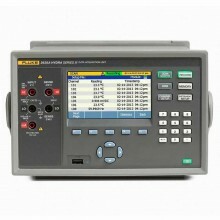 Includes: Fluke 2638A/20 Data Acquisition Unit / Data Logger: 20 universal channels. Includes one relay board (2638A-RLY) and one 2638A-100 connector. The Fluke Hydra Series III continues the Hydra Series legacy of precision, multi-channel data acquisition. The new Series III improves on Hydra's industry-leading thermocouple accuracy and adds a new dimension to how you collect and view data in a portable system. The 2638A is expandable from 22 to 66 channels of differential analog inputs. A flexible, 22-channel Universal Input Connector lets you connect and disconnect any type of input to any channel, quickly and easily. Selectable inputs include dc voltage, ac voltage, resistance, thermocouple, RTD, thermistor, frequency and dc and ac current. 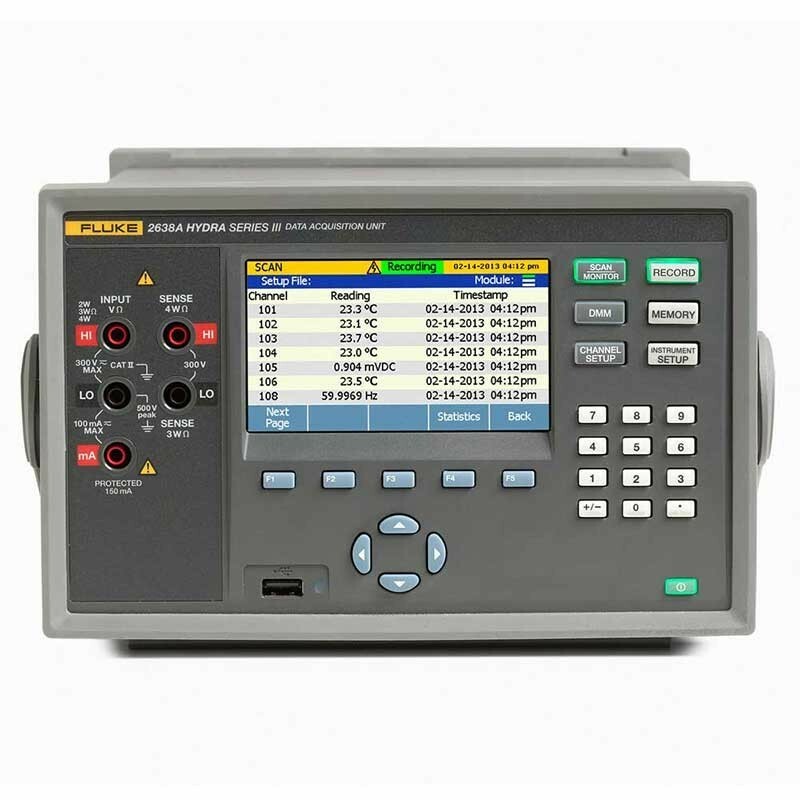 With DC measurement accuracy of 0.0024 %, basic 0.5 °C thermocouple accuracy, full-color display, easy-to-use menu system and industrial safety ratings put the 2638A in a category of its own as a precision data acquisition system. The dedicated 6.5 digit digital multimeter (DMM) mode provides additional utility and value. 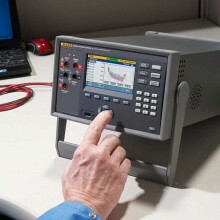 If you need to “zero” a large number of thermocouples to a known reference temperature before starting a temperature profiling or validation test, the 2638A will normalize all readings to your reference channel at the push of a button and store the offsets for reference in a supporting data file. 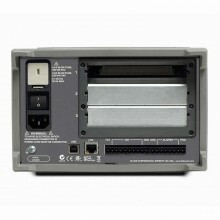 Power selection: Specify 100 V, 120 V, 220 V, 240 V power when ordering (power settings may be changed by the user). Up to 66 universal differential isolated inputs. On-screen color trend graphing of up to four channels at a time. Easy-to-use menu system for setup and data management. Input types: ac V, dc V, ac I, dc I, thermocouple, PRT (2, 3, 4 w), thermistor, resistance (2-4 w), frequency. 6.5-digit bench DMM function for front-panel inputs. Monitor function for real-time viewing and charting between scans. One-button screen capture of chart or data displays. 45 channels/second basic dc scan rate. Internal 57,000 scan/setup file memory. 300 V CAT II input safety rated. Other Thermocouple types R, S, N, E, B, C, D, G, L, M, U, W.
Power consumption: 34 V A peak (24 W average). Remote commands: SCPI command set. Internal memory 57,000 scans, 1000 setup files. File security Dual level, Administrator, five secure users, Guest status. Alarm outputs 6 TTL alarm outputs -- assignable to one or multiple channels. Alarm setpoints 2 assignable setpoints/channel, Hi Lo, Hi Hi, Lo Lo. Language menus English, Chinese, French, German, Japanese, Korean, Portuguese, Russian, Spanish. Warm-up: One hour to full uncertainty specifications. Storage: 20 °C to 70 °C <95%. Dimensions 150 mm x 285 mm x 385 mm (5.91 in x 11.22 in x 15.16 in). Weight 6 kg (13.2 lbs). Fluke 2638A warranty 2 year.